Sadly all good things come to an end and Bacon Week is coming to a close. Wanting to end it on a sweet note, we decided our last recipe should be a dessert recipe. 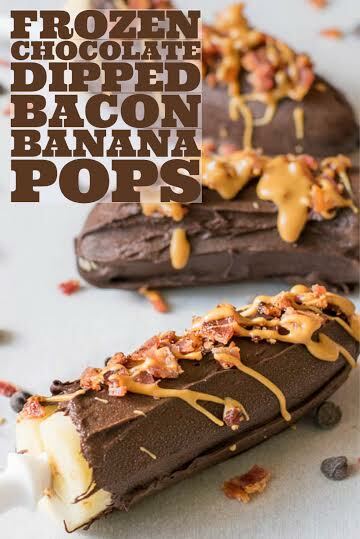 Bacon and chocolate are not an uncommon pair but we wanted to think out of the box a bit more. 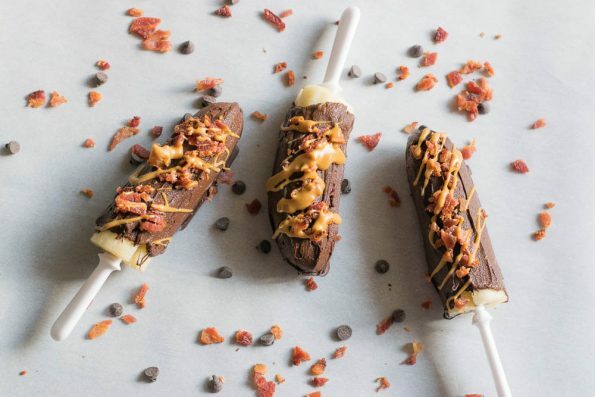 Then the idea came to us, we’d do a Frozen Chocolate Dipped Bacon Banana Pop! This recipe had a few inspirations. First we were inspired by Elvis Presley’s favorite sandwich. This sandwich is comprised of peanut butter, bacon, and bananas. Seriously if you haven’t tried this, you are missing out! Peanut butter and bacon sandwiches are kind of the business. The other inspiration behind this recipe was a dessert we had at AZFoodie‘s Homeboys Habanero Pop Up Dinner. They did a frozen banana dessert and we loved it! This dessert is the perfect way to wrap up our first annual Geeks Who Eat Bacon Week! Hopefully you’ve enjoyed it as much as we have! What was your favorite recipe this week? Do you have a favorite bacon recipe to share? There is still time to let us know! Comment below or use the hash tag #GWEBacon! Freeze bananas on a parchment covered cookie sheet for at 40-60 minutes. While banana is freezing, cook bacon and set aside to cool. Melt peanut butter by microwaving for about 30 seconds until runny. Removing from the freezer one at time, dip banana in chocolate. Sprinkle with bacon and drizzle with peanut butter. Repeat until all bananas are done. Freeze for another 60 minutes. Do not let your bananas get warm while dipping chocolate, it will not stick! We also found our Koji reusable popsicle sticks to be a tad too big for smaller bananas; this caused them to split at the bottom slightly.